Junior teachers, teachers with a temporary contaract with talent and passion for education can, as we all know, work at the university for a set maximum of years. Then they have to find something else, even if you have a prize as teacher of the year. The way the university throws out an important reservoir of knowledge and skills every year, expresses this simple implicit message: we prefer not to invest in education. This has negative consequences for the quality of education, increases the workload among staff and detracts from the sense of community within the university. It causes other additional problems: The temporary acceptance of teachers encourages the destruction of capital, temporary teachers regularly work outside of their duties and temporary teachers have an uncertain and unclear future perspective. Against this we come into opposition as WOinActie. To show your sympathy with temporary teachers and to indicate that it is time for a real solution: sign this petition ! On 28 January, Rens Bod and Ingrid Robyens were on behalf of WOinActie at the Commission for the Funding System for Higher Education, chaired by Martin van Rijn. This committee received the mandate from Minister Ingrid van Engelshoven to issue an advisory report that eliminates the most important bottlenecks In Higher Education. However, this committee works within certain preconditions: the macro budget remains unchanged and the relationship between first and second funding does not change. We believe that it is not possible to tackle the bottlenecks within these preconditions. That is why we advised the committee to return it's assignment to the Minister. What scientific education does need is an alternative funding system without these preconditions. We must have this discussion! We have provided the committee with seven principles that an adequate funding system for scientific education must meet. Principle 2: the interdependence between research and education must be guaranteed. This requires, among other things, that the research component in the 1st funding stream is in line with the educational component, something that DeJongeAkademie also advocated for the committee. Principle 3: All perverse incentives must be removed from the structure of the funding for university education. Think of promotional premiums, distributing education fees according to the market share in diplomas and credits, etc. Principle 4: Emphasis should be placed on educational quality, instead of educational quantity. No teachers at the university have the working conditions so that they can provide good education. Now there are insufficient facilities for that, and the stimuli are focused on quantity. Principle 5: research projects of the second and third funding stream may not have negative effects on the first funding stream. Context: the 'matching' that is now required for 2nd and 3rd funding projects (NWO and EU) is very large, and is constantly increasing. This is detrimental to the regular (unbound and education-related) research, and also explains the dire financial situation that the universities are in. Principle 6: the financing of the university must strike a good balance between rest and stability and stimulate universities. Explanation: competition has been totally ignored in hypercompetition that is inefficient. And there is far too much institutionalized mistrust. These 7 principles make it clear that it is impossible to solve the bottlenecks in academic education (not only technical complaints but too high a workload, bad contracts, too many academic staff who have little or no research time in practice) within the preconditions within which the Cie Van Rijn has to do its work. 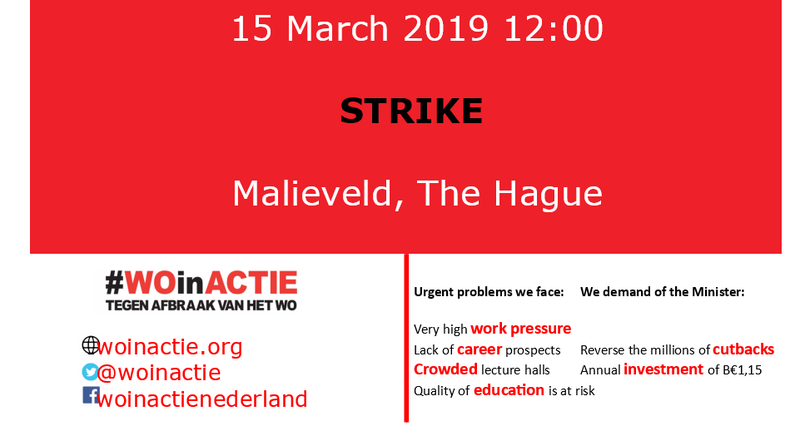 That is why the preconditions must be removed, and we must have an open debate about what an adequate funding system for academic education in the Netherlands could be. The current system violates all 7 principles. We will continue to fight for this! WOinactie wants to call on everyone, outside and inside of the universities, to support our cause and to sign our petition on DeGoedeZaak! If you cannot attend our demonstration upcoming 14th of December at 13h in The Hague, you can support us in this way! Want to help out? Contact the delegation in your own city. Keep an eye on this blog or our Facebook for announcements! Since the Minister of Education has not honored our demands to abolish the cut-backs on university education and research and as tinvestments are still not being made into education, a demonstration was organized on December 14th. The demonstration started at the Koekamp in The Hague. This action was supported by an increasing number of executive boards. A number of executive boards also promised to arrange buses to the demonstration, or to not uphold the attendence on this day. The actionweek from On Prinsjesdag the ultimatum expired that WOinActie had put to Minister Van Engelshoven last May 22nd. The demands(existing plans for buget cuts on academic education have to put off, and a additional structural investment of 1.15 billion per year) have not been met, and therefore the national action week has taken place from Monday 24 September to Friday 28 September. Across the country teachers and students have worn read squares at the opening of the academic year. 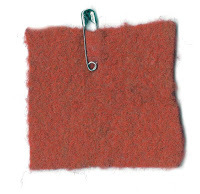 On the 22th of May a letter was sent to the minister by members of WO-inactie, FNV, ISO, VAWO, LSVb, and H.NU to set an ultimatum for the policitions to meet the following demands: 1. 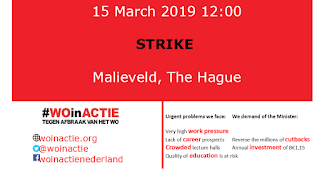 The doelmatigheidskorting has to dissappear and 2. there have to be net, structural investments in Scientific education in the form of university teachers. In the letter the actionweek was announced. The original letter can be found here.